The »JANUS Mobile App« is our reference implementation from both worlds – Stanley PAC SecureNet and metaSEC MIDAS. 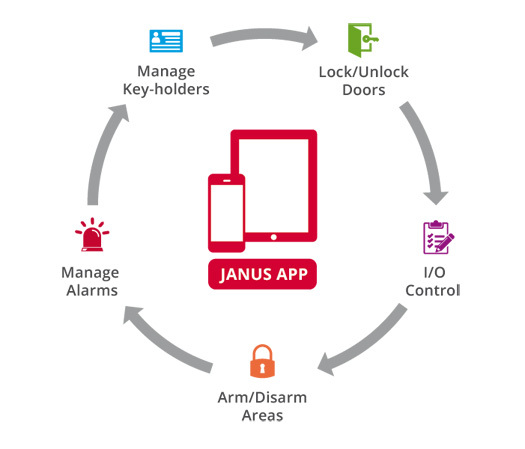 JANUS supports every feature which the SecureNet OEM Interface has to offer, and combines them with MIDAS representation – and communication functions. Well-known MIDAS functions like its server-side management of security policies, push-notifications or the SIP client are already implemented. Furthermore any useful combination from both worlds can easily be integrated to enhance security or other benefits for the user. JANUS supports tablets, smartphones and high-end desktop phones. (Android, iOS, WinRT). JANUS is an excellent assistant for security guards and similar staff. Alarms can be quickly qualified to deliver a basis for further decisions.